Fifteen people suspected to have been variously involved in the shooting incident at Lapaz that claimed the life of a policeman and caused injury to another have been arrested by the police. The suspects include a 27-year-old female, Charity Otuboa, a trader; six Nigerians and eight Ghanaians. The names of the suspects are (see above photo); Ken Ikponnwosa, 23; Faith Ogieriakhi, 35; Fem Erhuumwunse, 20; Michael Ogbegia, 20; Sampson Aja, 27; Emmanuel Aimiu, 31, and Kwasi Nyarko, 33. The others are Raphael Nii Lartey Coffie, 37; Asare Frederick, 35; Mark Enchil, 31; Kwadwo Afari, 32, and Kwabena Gyasi, 20. The rest are Abudu Mohammed and Salusi Zibu, whose ages are yet to be established. Briefing the Daily Graphic on the arrest of the suspects yesterday, the Accra Regional Police Commander, Deputy Commissioner of Police (DCOP) Osabarima Oware Asare Pinkro III, said a combined team of detectives from the Criminal Investigations Department (CID) Headquarters and the Accra Regional Command picked up the suspects from different locations in Accra. 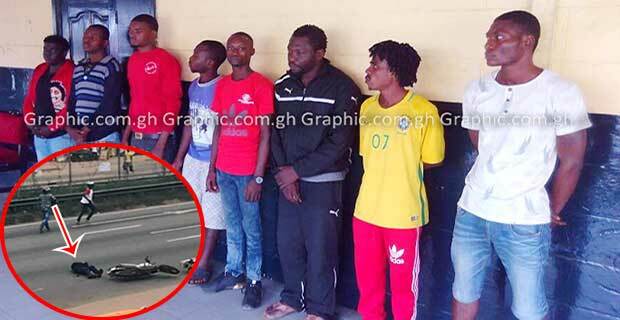 “The suspects were arrested at different locations in Accra, including Ablekuma, Olebu and Kasoa after the police had picked up intelligence and tip-offs. “The unregistered Hyundai Elantra car that was snatched by the robbers at the scene of the incident was abandoned at Olebu and is currently with the police. Other exhibits that were retrieved from the suspects include empty shells and an unregistered Royal motorbike,” he said. Osabarima Pinkro said the police were still interrogating the suspects and looking out for possible leads that would ensure that all persons involved in the robbery at Lapaz and the subsequent killing of Constable Daniel Owusu and causing injury to Constable Alhassan Jibril, both of the Community Policing at the Police Headquarters, were arrested. Asked if the 15 suspects who had been arrested included the two who had carried out the shooting at the robbery scene, he said the police were still doing due diligence to be sure of the role each of the suspects played in the robbery. “The fact is that some arrests have been made and we are still carrying out detailed investigations into the issue. I believe that the suspected gunmen are part of the arrested people,” he said. Narrating the events of that fateful day, as given by Constable Jibril, Osabarima Pinkro said the two policemen were on patrol duty when the unfortunate incident happened. “We visited the policeman who survived the attack at the Police Hospital today. He is responding to treatment. What he told us was that the two of them were on patrol duty that day. When they got to the Abeka area, a woman was crossing the street dangerously and so he (Constable Jibril) stopped to allow the woman to cross. “The robbers stopped by his side and so he least suspected any danger, only for one of them to pull a side arm and start shooting at him. The first two shots missed the target but the third one hit him on the hand, making him lose control and fall. The gunman ran out of bullets after giving many warning shots to disperse a crowd that was advancing on them. “When they were trying to reload the gun, Jibril mustered courage and got back to his feet and managed to flee from danger. As to what happened to the deceased policeman, the survivor could not explain,” he said. Osabarima Pinkro urged members of the public to be security conscious and collaborate with the police by giving relevant information that would help clamp down on the activities of armed robbers. Two suspected armed robbers shot and killed a policeman and injured another near the Las Palmas Restaurant at Lapaz in Accra last Thursday. The robbers escaped afterwards in an unregistered saloon car they snatched from a driver who happened to be at the crime scene. 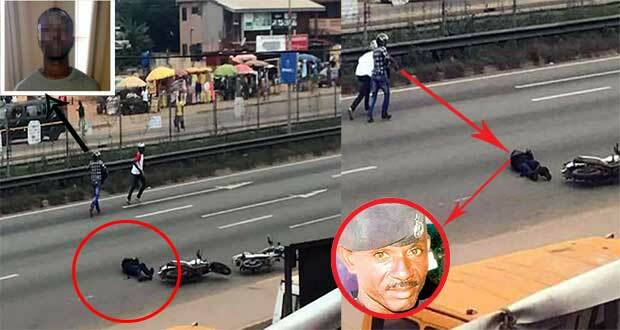 The suspects abandoned their motorbike and headed towards Kasoa in the Central Region. 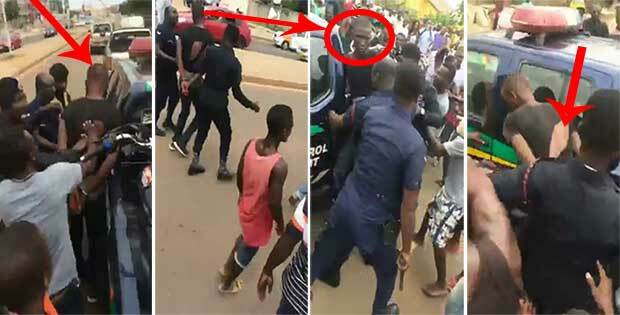 To facilitate the arrest of the suspects, the Police Administration last Friday placed a GH¢10,000 bounty on the two suspected armed robbers.